LUX PRIVATE POOL PENTHOUSE FACING THE CARIBBEAN IN OLD HISTORIC TOWN! A one of a kind property! This maid-serviced apartment is located in the ancient city center of World's Heritage colonial Cartagena de Indias. 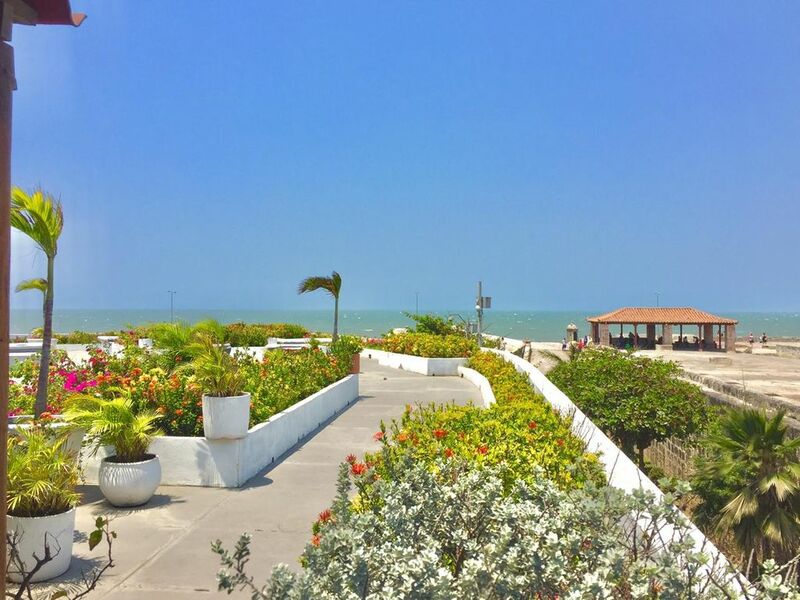 This Pent House boasts 360 degrees magnificent views over the Caribbean and the most important City monuments, Castillo de San Felipe, Cathedral, the University old Tower, etc, etc. The ocean is so near that you can hear the waves leaping the beach. While still an apartment, the only one located on the top floor of the building, the property really feels like a single family house, as it is surrounded by your own terraces of 900 sq. m ( 10,000 sq. feet ) and an additional private roof-deck of 260 sq. m. ( 2800 sq. feet ) accesible from your own living-room. On this roof deck there is a built-in private small infinity shallow pool from where you can enjoy the most fabulous Caribbean sunsets. The apartment has massive built-in gardens throughout where flowers blossom literally every day. The PH is fully furnished, with internet connection, 84´ smart TV, Wash and Dryer, fully equipped kitchen, linen, etc, etc. Other amenities include a castle-view outdoor Jacuzzi, imbedded on teak deck, and three gazebos plus outdoor cushioned platforms and beds. Last but not least the PH includes two maids, one a live-in who cleans and can prepare your breakfast if you do the shopping. As a former World Bank manager I traveled the world extensively in development projects and fell in love with Colombia at large and particularly with this amazing magical city in Cartagena de Indias where I´m now semi retired. I spend here almost half of the year and enjoy having guests the rest of the time. It gives us great satisfaction to share this place with potential visitors our property and make friends along the way. Please enjoy it as much as we do. Incredible location within the ancient colonial wall, with the most amazing sunset views over the Caribbean and most city monuments and huge open space to lounge around. View, location, space, maid services. At the heart of the historic city center of colonial Cartagena. Hardly 100 yards from the building. Impressive views of the Caribbean Ocean and beautiful sunsets. Gated parking is provided free of charge in the building. A complete set of kitchen-ware is provided. Several dining areas provided in this huge apartment either inside or outside at fresco in the terrace or private roof-deck by the pool. Three led tvs. The one located on the master bedroom is an 84' 4k led smart tv. A small family library with Spanish and some English titles. Private outdoor pool in your own apartment. Live-in maids included in the fee. This is a maid-serviced property. They can do your shopping and prepare your breakfasts and lunches. Please note that they do not prepare dinners. Penthouse is in a perfect location, it’s clean and bright with an amazing deck. Ana and Nicholas were terrific and very helpful (Ana is a great cook). And Alberto is available 24/7 if you need him. This is a very cool place. The massive balcony is wonderful to hang out, read, eat and relax in. The staff is ever present and very helpful. My husband and I stayed at this property for several nights and enjoyed it thoroughly. The apartment is just as portrayed in the pictures. Master bedroom and second bedroom have air conditioning, but the best part is being able to sit in the breezy shade in one of the several seating areas in the beautifully landscaped terrace. There are both ocean and city wall views. Location is in the walled city and all shops and restaurants are walkable. Just to be transparent, the pool, although pretty, is a small, shallow wading pool. And Ana, the housemaid, is very present (as some other reviewers have noted.) . But she is lovely, makes a very good breakfast, and we were prepared for her presence. Overall, staying here was just as nice as we expected, and a swimmable pool would have earned the 5th star. All i can say is book it. Amazing place in quiet end of the walled city. Deck is bigger than most houses. Anna is wonderful and will feed you way too much if you let her. Alberto is great to deal with. Can.t wait to go back. The location is spot on! Very near all restaurants and activities yet on the outskirt and therefore quieter than you would expect. We were not bother by any noise while we were there for 5 nights. Staff is helpful with questions and needs but do hang out in the apartment which could be uncomfortable for some at times. Beds, pillows, and bedding in both rooms are better than most rental which makes for a very confortable sleep. Both have excellent air conditioning (a must!). The second bedroom is on the smallish side but perfect for kids (for couples as well but they would likely feel shortchanged when comparing to the spacious master bedroom). We hung out a lot in the master bedroom's "living room'' just to be in the air conditioning! The terrace is wonderful, gets a good breeze and furniture is comfortable. I did not expect much from the pool but it is surprisingly deep enough to sit and hang out while watching people walking on the fortifications. The historical centre and Getsemani is totally walkable in less than 2 days including a visit to the San Felipe Castillo). There are great restaurants in Cartagena so we spent a lot of time researching and trying new ones. We really like brunch at the Cafe Lunatico (try their Cava Sangria). We also chartered a private boat with Boats4us for the day and we had a good day visiting wonderful beaches on many islands an hour out of Cartegena. The sea was rough though so it is not for the faint of heart. This property is located at the heart of the old city, within the ancient colonial walls, one block north of the Famous Santa Clara Hotel in the Historic Center. First front line from the Ocean which not only you see but you can also hear. Other Activities: shopping, bars, restaurants and cafes nearby. Also there is a beautiful square right in front of the property where you can buy crafts and art in the famous 'Las Bovedas' under the ancient colonial historic walls right in front of the ocean. ON one of the sides of the square there is a very interesting museum, a church school and the old famous convent Santa Clara often featured in Garcia Marquez´novels and now converted into a 5-star hotel. While at the city center this property is located in Barrio San Diego,a residencial area and, though, restaurants, cafés and bars are nearby, the neighborhood still maintains the real character of the authentic Cartagena population that were born and bred in the area.